PC gamers nowadays like to have their rig housed in a nice case; especially one that can help keep those all important components cool while also offering ample space for future upgrades and also to look good at LAN parties! However, many people when looking for a PC case look first at the image and then the comparative cost – often equating the two together: you get what you pay for. However, when shopping for a new PC case, this isn’t always the case – pardon the pun – and you can get a quality unit for relatively little outlay. The Akasa Zen PC case falls into this category as a fully featured unit, which really should cost way more than it does. So what is so good about it? The Akasa Zen case is available in five colours – white, black, red, green and blue – but regardless of colour, the case is physically identical so this review applies equally to each. For the purposes of the review, we look at the black model of the Zen, which houses the author’s current PC setup and was bought from UK online retailer, Dabs.com for £29.95. The case packaging is huge and the case itself is sheathed in a polythene covering and secured inside the box by polystyrene inserts. The box was sturdy and make of thick cardboard, which protected the case unit well in transit. The box features a colour identifier sticker, while the specifications of the case are listed on the sign panels in a range of languages. The box features the black version of the Akasa Zen case on one side, while the white version features on the other. The case does not come with a power supply, but even if it had I’d imagine most PC enthusiasts would likely swap the installed unit for a branded PSU anyway, so this is no real issue. Although the price tag of £30 suggests the Akasa Zen is firmly aimed at the budget end of the market, the features of the case make a mockery of that mark. Appearance-wise, the black version has a matt finish, but this is somewhat detracted from by a slightly tacky looking clear plastic surround. That aside, however, the case does look very nice. The front of the case has power on/reset buttons and a drop-down cover which conceals the audio I/O ports and front-mounted USB. The reset button is slightly recessed, so there is less chance of knocking it accidentally, while the drop-down cover feels remarkably sturdy. The power on button feels a little loose in its socket, but is secure enough. It casts a dim, bluish light when the PC is powered on. The top-most external drive bay, designed for an optical drive, has a cover which conceals your CD or DVD-ROM drive, so you don’t need to worry about buying a matching drive. One drawback to this was the fact that the optical drive could only be opened using the drive’s button – to close the drive involved pushing gently on the drive tray as the button becomes inaccessible when the tray is opened. The rear of the case sees a honeycomb grille covering the fan housing, while there are 7 PCI slots available. A small vent also sits above the PCI slots, further helping airflow inside the case. 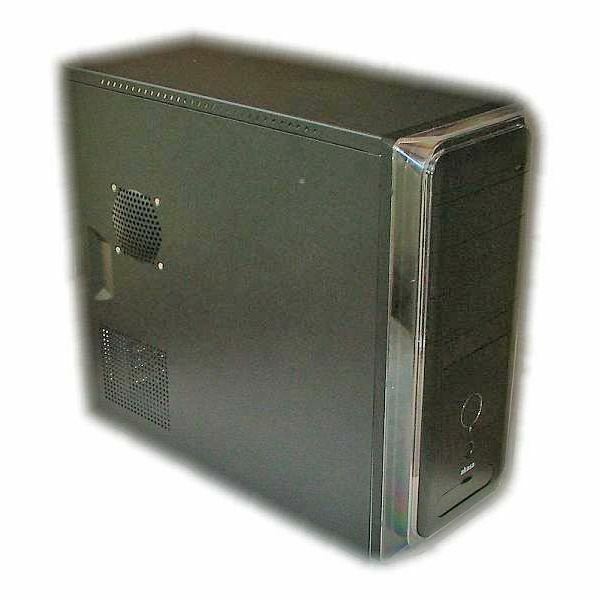 The side of the case features two further vents; one is positioned towards the bottom of the side panel, while the other is further up, and sits atop the CPU. A small third vent runs along the top of the case, reaching almost its full length. Looking at the drive bays and supports, there were no sharp edges – often the sign of a cheap case – and each edge was in fact rounded off to make working inside the case very easy. Having suffered many a cut finger from sharp edges in budget cases, this was a welcome sight. Hearking back to the top cover of the optical drive, I found I couldn’t fit my DVD-RW drive into the bay from the front of the case and instead had to fit the drive through the case internally. While not a big issue when the PC case isn’t fully kitted out, it could be problematic in the future should the drive ever fail, as parts of the PC would require to be removed in order to swap in a new optical drive. You could probably remove the front panel entirely though, but either approach seems convoluted. Another small issue was the fact that the motherboard mounting holes weren’t marked so it was a bit trial and error as to where the mounting screws should be positioned. Again, not a major issue but a minor annoyance. Akasa have implemented a screw-less drive retention system, which involves snapping down plastic flaps into the drive’s screw-holes. However, I found the flaps to be loose when applied, and didn’t feel they secured the drives adequately. As a result, I resorted to good old fashioned retaining screws to secure my drives. Unlike other cheap PC cases, Akasa have addressed the problem of the front-mounted USB and audio connections by providing a moulded single block for each which plugs directly into the motherboard. Most budget cases have cables with individual pins for these devices, which have to be connected individually – a real pain. Akasa’s approach makes things much easier, and less prone to installation mistakes. Once the PC fired up, I found the two Akasa fans included with the case to provide adequate cooling while also being very quiet. The case seemed sturdy, with no annoying vibrations or rattles. While the fans shifted a fair amount of air, I would have liked to have seen the effect the venting pipe would have had on the CPU temperature. Due to the size of the after-market CPU cooler I was using, this was not possible and is a point to note for anyone considering using a third-party cooler in the Akasa Zen. For the money, the Akasa Zen is an excellent case for PC gamers or home enthusiasts. It looks good, performs well and has many of the features one would expect to find on more expensive PC cases. The case is extremely roomy, easy to work with and offers plenty of scope for overclockers, who need good airflow characteristics and components for cooling purposes, such as additional fans or water-cooling systems. Those who prefer the aesthetic pursuit of case modding may feel the opportunities afforded them by the Akasa Zen to be a little disappointing, however. Cons: Some components can be tricky to install; optical drive cover blocks access to eject button when disc tray is out; CPU vent may not accommodate some after-market coolers. Overall the Akasa Zen is a good choice for anyone looking for a good, well-specced midrange PC case. While it doesn’t feature transparent panels, neon lighting or other visual elements, at £30 the features of the Akasa Zen cannot be faulted. The inclusion by Akasa of 2x 120mm fans into the chassis is an excellent addition, with the only small drawback being the limited air intake through the front of the case. 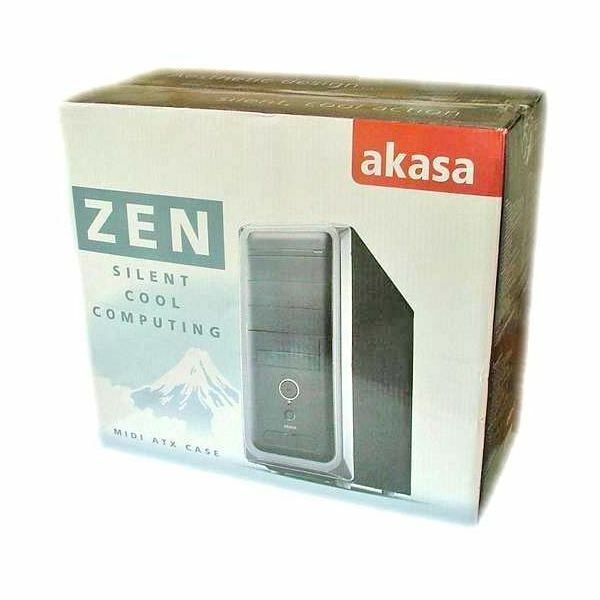 But while the case does have its flaws, they’re minor enough to be overlooked and the Akasa Zen is a strong contender.